Flexoprin Review – Is This Product Safe To Use? Flexoprin is presented as being a revolutionary way to treat bursitis. Not to be confused with Flexiprin, it is a supplement that is claimed to provide almost instant relief from the pain associated with bursitis. This supplement is promoted online through Flexoprin’s official website, but the link to purchase this supplement does not appear to be currently fully functional. Because of this, determining the cost of Flexoprin is nearly impossible, as this information is not featured on the product’s official site. What are the Ingredients Used in Flexoprin? The Flexoprin product formula is not featured on its official product website. All that is said about the ingredients in this formula are that they include scientifically tested compounds that have been proven to be effective in fighting off pain. It is claimed that users of Flexoprin should enjoy relief from the pain associated with bursitis, decreased soreness, improved energy levels, and help for them to once again enjoy their normal, everyday activities free of pain. This product only needs to be taken twice a day in order to produce these promised benefits; Users are to take one tablet in the morning and one tablet in the evening. It is unclear whether or not there are separate capsules for the morning and evening tablets or if these tablets are the same. What are the Pros of Flexoprin? What are the Cons of Flexoprin? No list of ingredients is provided online. There is no satisfaction guarantee supporting purchases of this supplement. Clinical trials conducted directly are not cited. 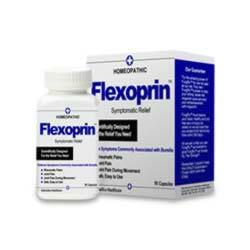 Not enough information is provided online about Flexoprin. The price is unclear, and the link to purchase this supplement does not appear to be currently functional. No full list of ingredients is provided, and clinical studies are also not cited. Only one user review is featured, and a timeline for when results can be expected is not provided either. Overall, consumers should probably ignore this supplement and choose an option where more information is provided online.